Optimal health and well-being for all of Philadelphia’s Faith and spiritual communities including health providers. Faith and spiritual affairs is dedicated to informing faith and spiritual communities about behavioral health care services and reducing the stigma of behavioral health concerns. By partnering and collaborating with faith and spiritual communities, city agencies, stakeholders, DBHIDS will develop ways to provide health care to the community. “80-percent of the world’s population believe in a power greater than themselves and call upon that power for healing. FSA utilizes the public health approach to educate communities of faith with Evidence Based trainings, workshops and conferences with a focus on educating communities of faith on signs and symptoms of behavioral health along with local behavioral health resources and programs. The success of FSA in the community is due largely to the diversity and support of the FSA advisory board which is comprised of clergy from diverse religions, agnostics, academics, providers and grassroots organizations who are committed to opening their doors to DBHIDS staff and stakeholders to provide supports to communities of faith. One of the more successful trainings utilized in the faith community is Mental Health First Aid (MHFA). Since the implementation of the training (August 2012), well over 40 trainings have taken place in churches, mosques, and synagogues with over nine hundred people from the faith community being trained. 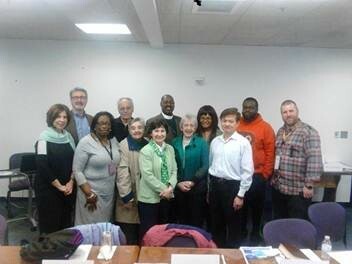 Additionally, several clergy from the Christian, Muslim and Jewish community are MHFA instructors. The annual conference is an example of a successful model of bringing awareness, education and resolution to the community on issues and challenges which may impact individuals. Over the past ten years more than 3,000 people from the faith, provider community and individuals with lived experiences have attended the conference. The attendees have been afforded the opportunity of experiencing workshops presenters who are experts in the field of trauma, behavioral health services, incarceration, reentry, children’s services, intellectual disabilities, HIV/AIDS, violence reduction and services for the ageing. The three year strategic plan for FSA is to provide an exceptional training designed for clinicians and those with a background in behavioral health service provision, a context to current research on faith and behavioral health, and equip them with tools and best practices for addressing the spiritual lives of individuals with behavioral health challenges, also to begin the conversation on addressing cultural competence’s and personal biases. The training will provide a range of resources and opportunities to learn from individuals who are currently practicing in this area in both inpatient and outpatient contexts. On April 25, 2015 FSA celebrated ten years of service at the annual FSA conference. The celebration was held at the Pennsylvania Convention Center, over 500 people were in attendance, there were 16 workshops, 23 workshop presenters and well over 40 resource tables, Reverend Dandridge Collins, Ph.D., was the Keynote, thirty people were recognized for their support, commitment and trailblazing of FSA over the past ten years. During 2014/15 FSA provided, Lunch and Learns, a summit on March 1, 2015 on “Why Faith Matters,” on March 18, 2015 a pilot workshop on “Advancing the Integration of Spirituality in Behavioral Health Care,” was presented at Friends Hospital “A Comprehensive Behavioral Health System,” to people from a variety of backgrounds. with lived experience attended the workshops and summit. For more information on FSA and upcoming events please contact: Mary.L.Harper@phila.gov and Jaye.Darden@Phila.gov.